If you or your Organisation is based within the UK, payment for ChurchSuite will be by Direct Debit (through GoCardless - see below). For all other regions, payment will be by credit or debit card. Please note we are unable to accept direct bank transfers, cheques or card payments by phone. To set up your payment subscription, log into your ChurchSuite account with Administrator access. Go to the Administrator menu. Click on the Billing menu. The Billing section is not visible while your account is a trial. 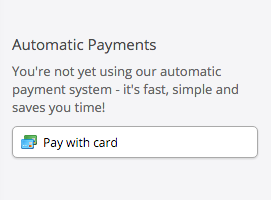 On the right-hand side of the screen is the Automatic Payment message. Click the Pay with card button. This will take you through the process of setting up a card payment subscription with Stripe. All prices quoted on our website and invoices are inclusive of VAT at the current rate of 20%. On the right-hand side of the screen is the Automatic Payment message. Click the "Pay by monthly direct debit" button. This will take you through the process of setting up a GoCardless payment subscription. 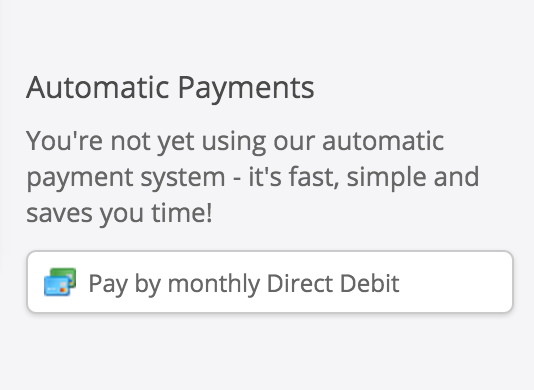 Note: The "Pay by monthly Direct Debit" button is not visible if you have an existing direct debit set up. If you are changing your bank details, drop us a line at support@churchsuite.com and we can cancel your existing direct debit. Once done, the button will become visible and you can use it to set up a new direct debit. GoCardless will email (example below) with a link to your dual-signature mandate. You simply need to print the mandate, have it signed as appropriate and then scan and return it to GoCardless using the file upload option available from the link in their email (shown below). Once uploaded, let us know.It will take GoCardless and your bank a few days to process the uploaded mandate. 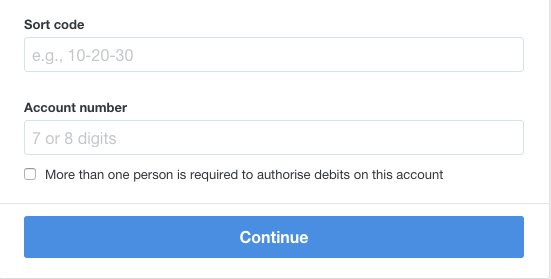 Once your direct debit status changes from 'pending' to 'active' on our billing systems, we'll be able to charge any unpaid invoices against the new direct debit. If you need to change your payment method (card or bank account) which is linked to your account, please email us at support@churchsuite.com to let us know. As soon as we receive your email we will amend your current payment method to a status of "cancelled". This won't cancel the Direct Debit with GoCardless or the card with Stripe, but it does tell ChurchSuite not to use those details when billing in the future. We will advise you by email when this change has been made and at that point, you will see the "Pay by monthly Direct Debit" or "Pay with card" button appear under Administrator > Billing. You can then enter the new bank account or card details to complete the update.